Parking: Street parking, at meters or after 6 pm on neighourhood streets where signed. 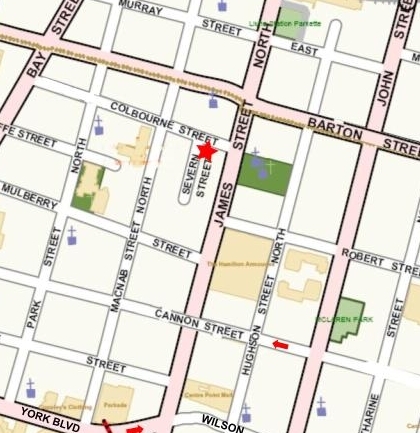 Municipal lots: on Mulberry St. and Hughson St. behind the Cathedral. DO NOT PARK in the lot across from us (BMO building). Parking is prohibited from 8 pm to 8 am every day. They ticket every night. By car: from the 403, take the York Blvd exit, go east on York Blvd. Turn left at James Street North. Turn left at Colbourne. 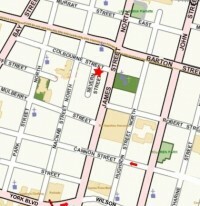 By car from the east: from Cannon, turn right at James Street North, and left at Colbourne. Or from Barton turn south. By train and walking: From the GO Station Hunter Street: Walk north on James Street, until you reach Colbourne. It’s about 10 blocks (a 20 minute walk). By public transit: many bus lines stop near James Street on King or Main. You can walk north about 7 blocks. Buses also run north/south on James Street.